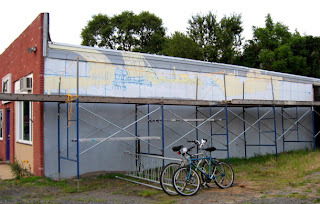 I sent off an e-mail to our mural chief early this morning, asking if there were plans to have any evening painting sessions this week. Upon returning home from work today, I found a reply saying that she would be there around 5 pm today to see if anyone else was ready to paint. I was a little late getting there, but no one else had shown up at all, so I didn't feel too bad. 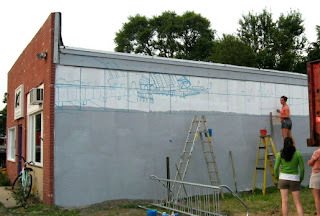 Our leader had put in several hours on it this morning and was too pooped to paint again tonight, and I didn't want to be up on the scaffolding by myself, so we agreed to just meet up Thursday evening before the monthly general membership meeting, hoping a few others join us at that time to continue work. 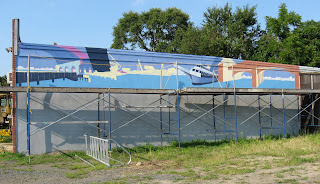 Since I made the trip to Belmar, I figured I may as well take and post a photo of the progress to date, even though I had no part in any of the colors added since my last mural posting. I drove up to the Studio today, making a quick stop at the local branch of a big art and craft chain that's going out of business. The art supplies were cleaned out long ago, but all store fixtures are for sale, and I got some nice paper display racks very cheap. They will do nicely as drying racks for small and medium prints, one for me, one for Molly. I dropped them off in the Studio, then went for a walk. I had heard that there was a big boardwalk art show in Ocean Grove today, so I walked down Main Avenue to find it. Mostly I was curious to see if anyone I knew locally was participating, and maybe promote my location at the other end of the road. But this was the professional art fair crowd with the standard folding tent-booth things, no one worth talking to. Since I was already on the boardwalk, I decided to continue north under the hot sun into Asbury Park and see Molly's show at Exhibit A. Passed the derelict Casino and other much photographed Asbury boardwalk ruins. I had never seen the gallery before, but I knew it was in the 5th Ave Pavilion, so it wasn't hard to find. It's a nice big space. Other than Molly's drawings and collages, mostly abstract work. As I left the gallery I noticed that the sky had darkened and I could feel a few drops of rain... and I was about 1.5 miles from my car. At first it was barely felt. As I neared the city limits of Ocean Grove the drops were more frequent, but it felt good on the still hot day. Still a block from Main it turned to a heavy sprinkle, but once I got a few blocks down Main the shade trees gave me some protection. Then the rain was gone, either it passed or I had walked enough to get out from under it. Between sweat and rain I was too soaked to do much work, so I went home. It turned out that a heavier piece of the storm had knocked out power in my town, not to come back for several hours, but that's another story. 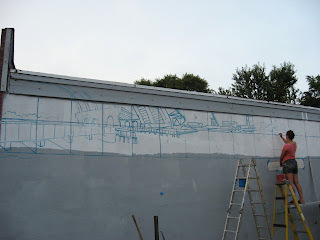 I went back to the BoatWorks today after work to continue work on the mural. Quite a bit had been done since my last visit- the pale yellow color had been blocked in all across and the sky color was put in. Today our crew of 3 artists used various blues from Siperstein's to put in all the water and the darker color under the bridge on the far left and the boat just right of center. 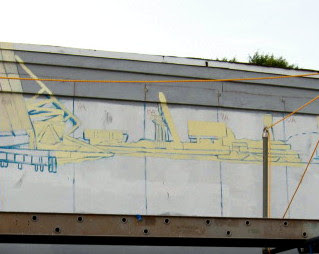 That pale yellow will mostly be covered over eventually, but meanwhile we get a real sense of how the composition will be working on the upper part of the wall. Don't know for sure when I'll be back working on it- probably some time next week. I decided to go to tonight's Live Figure Drawing workshop at the Belmar Arts Council. I regularly teach a college figure class, but with up to 20 students a night, I am too busy teaching to spend any time drawing. In fact, it's been almost a decade since the last time I drew from the figure with charcoal, but tonight I'm off duty, so I dug up my old supplies and drove up to the Boatworks. It was a 2 hour session, with a mix of short and long poses. 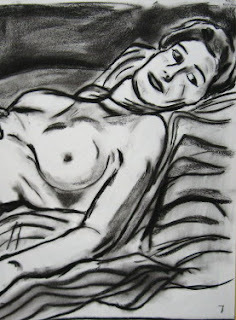 The drawing above is my best from the night, a 20 minute charcoal sketch. There will be two more of these workshops coming up later in the summer, and more may be added in the fall. 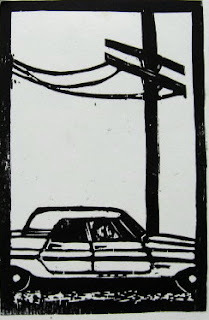 Next Wednesday Aug 1, from 7 to 9 pm, my studio partner Molly Johnson will be conducting her own workshop at the Boatworks, on the topic of printmaking of course. She will show examples of a variety of print processes, and all who attend will be able to pull a print. The $15 fee includes materials. Registration can be in advance or at the door. For more information, check out Molly's website and/or the Belmar Arts Council's website. 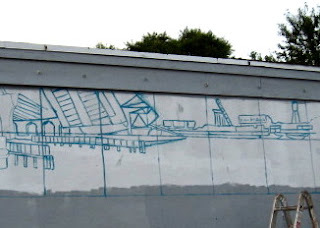 The Boatworks is on River Road, between 6th and 7th Avenues. Look for the purple door and a mural in progress on the side. Molly is also teaching a series of workshops about silkscreen in our studio space, the first class scheduled this coming Monday. For details on that, check Molly's site, or call her at (908) 675-1746. Went back to the BAC tonight after work for a few more hours work on the mural. As you can see, we now have some genuine scaffolding to help us with our process- makes painting the upper areas a lot easier. The task today was to use this buff colored paint to re draw some of what we did last week. 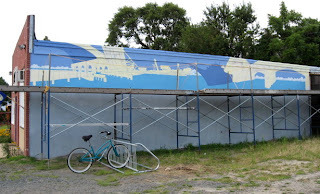 This corrects some of the proportional and perspective issues left from last week's rushed effort while hanging off ladders, as well as clarifies the scene for future mural participants. Top view is the whole building, the middle shows all the repainted areas (click this one to see all the details), and the bottom is the section I worked on myself. The plan for me is to return Thursday after work to continue the blocking in process, or maybe start painting with colors, provided to us courtesy of Siperstein's in Long Branch. Today's session saw work on a number of areas. First I dealt with the last untouched piece of the tower, the top left, next to the casino. 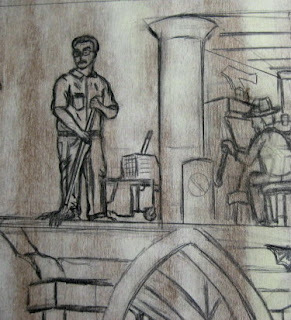 Here I put a janitor mopping the floor, with mop wringer pail. I based the figure on one used for a print from my Ecclesiastes series, but made it look a little more like me. He represents my prints that deal with work (especially last year's Employee), as well as my own experiences with paid manual labor. Next I put some airplanes in the sky, one each corner. Partly because they are a logical way to occupy the space, but also I have always been into airplanes. Even now when I go to D.C., a spin through the Air and Space Museum is on the agenda after I check out the art museums on the Mall. Of course, I always found military planes more interesting than passenger planes- more exotic shapes, markings, etc. And my favorite military plane of all is the WWII era North American B 25 Mitchell, a medium bomber. Something about the overall design and proportions, the shapes, the multiple gun mounts. It's record in combat was impressive as well. 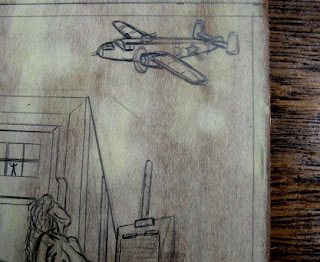 So I put a B 25 in the upper right, adjacent to the studio scene. 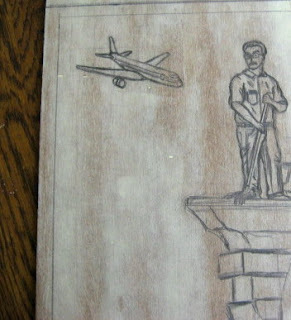 In the upper left I put an airliner, a plane I have more experience with as a traveller. Jets have taken me back and forth to school, overseas to see art in Italy, to art residencies, so you can say that it's part of my artistic life. However, almost as soon as I decided to put one there, I thought of another association. I don't think it's possible to see a passenger jet near a tower and not think about 9/11. On the other hand, this is an event I have dealt with in my art. So I decided to go ahead and put it in. I also posted a view of the whole block to date, now that the tower is more or less constructed. Click to see those details. 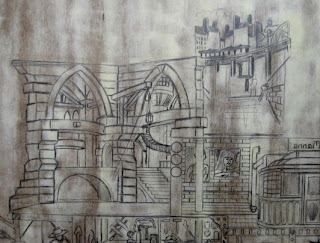 Next up is to come up with ideas for finishing the foreground and background around the tower. I'll give it some thought over the next few days, maybe be ready to try some sketches toward the end of the week. Revisited two areas of the tower today. Started with the upper right corner, the art studio. I had narrowed down the choice of figures to 3, and on paper sketched various combinations, before deciding on using these two poses together. I put the models in the studio, put in the drawing boards along the bottom, and reworked the easel a few times until I was satisfied. The figures need a little refining, but it's on the right track. Then I went on to the prison. I added 4 new figures, all from Hieronymus Bosch's Garden of Earthly Delights, a favorite painting since my youth. All are typical Bosch patchwork demonic creatures. The figures have little themselves to do with my art, but for me are symbolic of Bosch's work, and he and Bruegel are both very influential on my large complex composition prints, including this one. The figures also fill a few holes in the space. I still have to work out shadows and other details, but the prison is otherwise done. I left the Studio around 5pm, having changed into clothes acceptable to paint in, and drove to Belmar to help with the start of the mural. We had 8 or 9 people turn up to help. The first step was to put a grid on the upper part of the wall- smapped chalk lines to show horizontals, and using a straight edge (top photo) to mark the verticals. The 2nd photo provides a shows how it will appear relative to the whole building. The 3rd photo shows the progress made by 8pm, which is when I decided to call it a night. The last photo is a detail that shows the part I painted. These are just reference lines- all will eventually be painted over with the actual colors. I plan to be part of that process as well. Spent a few hours in the Studio today, most of that time showing old and new prints to an interested visitor. After she left, I put in a little more time on the new block. The next area to deal with is the upper right corner, which will show a classroom studio and a figure class. I consider the extensive access I had to figure models during my early years as an art major a significant factor in my development. In fact, it's pretty much how I learned to draw. I was taught a few basics in my 2D foundations class, but the Intro to Drawing class looked kind of dull, so I put it off and went straight to painting and printmaking. Meanwhile, the department organized open weekly life drawing sessions, and I started going to those. My senior year no faculty could be found to take charge of it, so I was given the task of organizing it- securing funds, reserving the room, scheduling the models, etc. The spring semester that year the department finally added a life drawing class, which I also attended, my first official drawing class. Took advantage of figure classes at my grad schools to further develop my skills in this area, dealing especially with portraiture at SIU. Like I tell my students now, learn to draw the figure, and everything else follows. So what I did today on the block was start drawing a studio space. Doesn't look particularly like any space I had a class in- more of a tribute to one of my favorite comics of my adult years, Mister X. 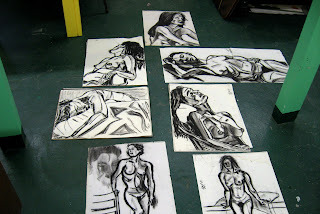 Then I took advantage of the great job Molly did cleaning the Studio yesterday to lay out on the floor various charcoal drawings from my Carbondale years. Like I said, mostly concentrated on heads then, but I found a few with parts or whole figures. My plan is to show one or more models posing, possibly using some of these as sources. I'll figure it out next time. No time for the Studio today as I had a more immediate task to deal with- my application for a fellowship from the New Jersey State Council on the Arts. During the past week I had done some preliminary work- chose the prints to include, working on the statement, gathering information. But it's due midnight tomorrow, so I couldn't delay the rest of the process any longer. First step was to shoot digital photos of the right size of most of the works, taking advantage of daylight and doing this outside. Took like 70 or 80 shots all together, looking for one good one of each. Downloaded these, edited the best ones. Next was registering with the online applications system. Then I started filling out the application. The system allows you to save your work and continue later, so I was able to take a break in the middle. Some was routine information, other parts required me to write up lengthy descriptions. Uploading the images wasn't a problem. Having reviewed all this at that workshop in Red Bank didn't hurt. Before I knew it I was done, so I submitted it. I still have to mail in a signed consent form, just have to have it postmarked by Wednesday. Want to know how this turns out? Check back in January, 2008 when they make the announcements. A quick session in the Studio today, spent working the dungeon area. I filled excerpts from several works of art that I chose yesterday for this purpose. The artists represented so far include Titian, Caravaggio, Bernini, Goya, Van Gogh, Ryder, and Kirchner, all influences on my art at various times. All still favorites. I expect to add a few more, but I didn't have those books with me today. Tonight is the opening for a new group show at Exhibit A, a gallery in the 5th Avenue Pavilion on the world famous Asbury Park Boardwalk. The reception begins at 8pm, no word on when it ends. One of the featured artists is my studio partner Molly Johnson. 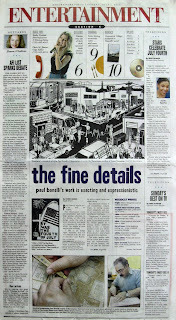 I think she's showing mixed media drawings rather than prints, but check it out anyway. After a long week of work, it was nice to get into the Studio today and continue work on the current block. 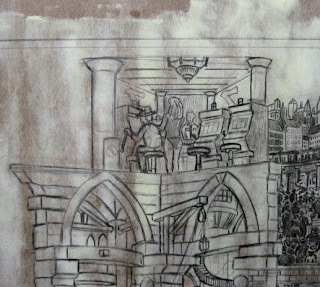 The drawing part of the day was devoted to the casino space on the top level. I reworked the slot machine on the left, added some figures (the cocktail waitress is borrowed from my print from the Ship of Fools group folio) and resolved the ceiling area. Still needs a little work, but this is more or less what I'm going for. I also devoted time to going through art history books looking for images to add to my dungeon. In the end I chose 10 artworks that were influential and/or personal favorites. Excerpts (mostly figures) from these will be added to that scene. I just took notes today, and will get to actual drawing next time. I've gotten a great response from that Asbury Park Press article from a couple of weeks ago, with the result that people have been asking about visiting. 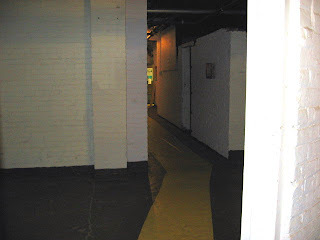 The problem is that our space is tucked way down in the basement, not always easy to find. (I got confused myself the first few times I was down there.) So to make it easier, here's a little help. First, it's recommended that you make arrangements first, to make sure I'll be there. 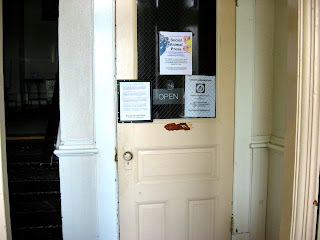 When you enter the front door of the parking lot of the Jersey Shore Arts Center, you'll see steps on the left and a door on the right (top photo). 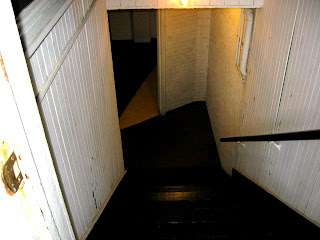 Open the door and go down the steps (2nd photo) to the basement. At the bottom of the steps you'll see a painted yellow path (3rd photo) on the floor. Follow this right to the door (4th photo). If it's open, one of us is in, so come say hello. It took quite a while, but today I finished up that city scene from Masereel. Very tedious work, copying all those figures, but I think it was worth it. 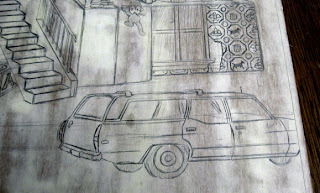 This is by far the densest drawing on the whole block, but color in the other areas should balance that out. It's a lot of detail, but it's the kind of stuff that cuts fast. Next to it on the left I continued the top layer, beginning to put in a casino. The hundreds of hours spent in Atlantic City casinos as part of one of my jobs asserted itself in a several prints over the years with gambling related imagery, so it's appropriate to have it in my tower. This is still very rough- the slot machines on the right are pretty much what I'm expecting, the others need a lot of work, and I have to make some decisions regarding the backgrounds. I need to capture the intensity of the casino experience. I devoted a few more hours to the block today, most of that working on the dungeon area. I fixed a few of the more obvious perspective issues, though a lot of little things are still unresolved. But it occurred to me that one way that Piranesi got around his perspectival inconsistencies was the extreme proliferation of architectural elements, so many that you can't track movements in space very far without running into something else. 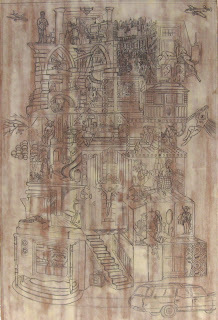 Some of his prints have dozens of stone piers, columns, arches, stairways (standard and spiral), wooden support beams and bridges (fixed and draw-type), towers, banks of windows, chains, and sculptures. (people, prisoners or other, are found in small numbers if at all) So I decided to start adding things to my dungeon. 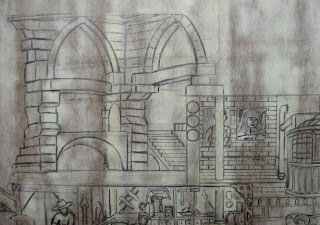 I added a heavy wooden structure hanging a lamp in the foreground, and added a variety of Piranesi inspired elements in the background past the arches. 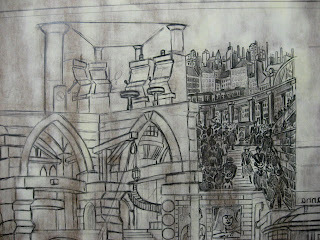 Sure enough, perspective of the foreground structures seemed less a problem once all that other stuff filled the gaps. I could have put in more, but since I'm planning to add figures/groupings to this scene, I decided to hold off until I know how much more space will be left. The other area I worked today is to the right and above, a city scene taken from Frans Masereel's woodcut novel The City. The 1925 book is my second favorite of his novels, not so much a narrative as a series of scenes from an unspecified European city of the time. Taken together it gives an impression of what life was like for its various inhabitants. 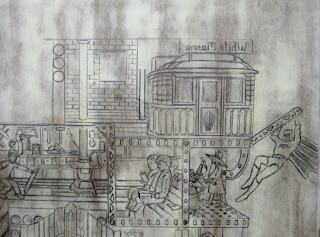 I started roughing in a scene today, looking up a stairway, an elevated railway towering overhead, tall buildings and smokestacks behind it, reaching toward the sky. (this will be part of the tower's top layer) Not yet in- dozens of people moving in all directions. I put in a few hours at the Studio this afternoon. I started with the SoHo gallery section, redrawing the brick wall and putting some art on the wall. My first trip to SoHo was summer 1989, just barely out of college, and my friend Dave was in town. We went into the city to meet up with our painting professor Bill Barnes, doing desk duty at the Bowery Gallery on Wooster. But we also spent time walking up and down the blocks, going in and out of dozens of galleries. 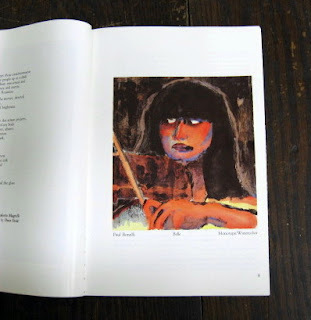 The thing that made the biggest impression on me that day was a show of watercolors by Graham Dean- large portrait pieces made of torn and collaged pieces, paint both washy and bold, with really bright intense colors. Very different from what we were taught in watercolor class. Some time later I did a black ink monotype based on a photo of our mutual friend from school, Belle Abenir. To make the print more exciting I decided to color it with some of those bold intense colors. The results can be seen above. Not really like Dean's work, but I liked it. Sent a photo to Dave, still down at school, and he also liked it. I made arrangements with him to submit it to the William and Mary Review, an arts/literature magazine put out once a year. My submissions during the years when I was still a student were always rejected, but this time I got in. (it may have been as much because of it being a portrait of Belle, friend to some on that staff) When it was time to pick some art to put in the gallery section my first impulse was the Dean painting we saw, and part of it is there behind the column, but I decided to put my Belle print in the more visible space. 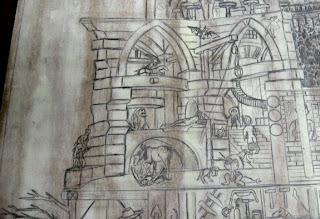 I devoted the rest of the session to working on a large structure based on Piranesi's Carceri (Prisons) etchings. These are a series of prints, odd Gothic fantasies of dungeons, loaded with columns of stone, bridges, beams, stairs, arches, etc. It serves a few functions in my print. First, I have always enjoyed them. Second, the architectural elements can form part of my tower's structure. Third, I intend to put bits from other favorite historical art in the space created. 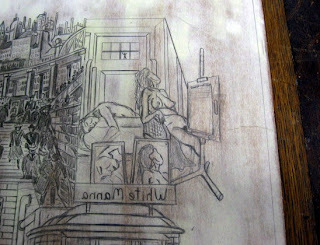 This was my least resolved section on the paper sketch, leaving me a lot to figure out now. 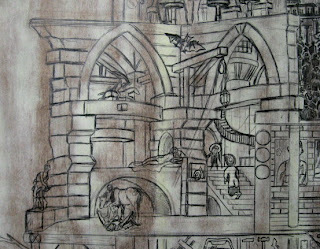 What's here is rough- the perspective is all over the place (an issue sometimes with Piranesi's originals as well), and I need to work that out before finishing the architectural detail, not to mention the figures. Looks like I may be stuck in this dungeon for a while. Okay, back to work now. I started up top on the 5th level on the right, adding two somewhat industrial environments above the Erector Set parts. I started with the far right, putting in the White Manna, a tiny 1930's era diner in Hackensack, a classic of art deco diner design in addition to making the best little cheeseburgers in the world. As a New Jersey born and bred artist, diners have to be part of this and White Manna will do nicely. 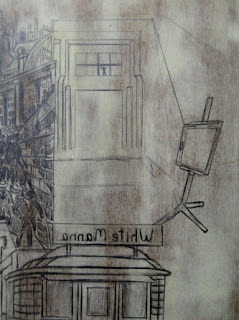 Next to that I started blocking in a space that represents buildings reclaimed by artists for studio/gallery purposes. This can refer to such things as the Glove Factory studios in Carbondale, or my current space in the basement of an abandoned high school, but I was specifically thinking of SoHo, at least the SoHo of the 80's when it was still an environment safe for artists and little else. Back then there were hundreds of galleries spread out in this former manufacturing district- some very proper white box spaces, some looking like the factories they had been. (locally SICA in Long Branch carries some of the spirit of the latter) As is the typical cycle, eventually people started coming around, artists were kicked out for retail, and now the district is an outdoor shopping mall. (still a few holdouts- I was in a show in SoHo a few years ago, the space a 7th floor walkup with a floor that was not really level) I still have to resolve the transition between the gallery and diner and pick work for the walls. Then I went down to the base of the tower and put in a vehicle parked in front, a Ford Ranch Wagon circa 1969, out of the family photo album. We had a series of large station wagons growing up, big long powerful vehicles. The wagon style has pretty much disappeared, split between mini-vans and SUV's. For me, this represents vehicles of the past. When I use a car in an image, it's often an older model- they have an individual style lacking in contemporary cars, where pretty much one looks like another. Same goes for appliances- stoves, refrigerators, etc. I just think that in the past things looked more like the things they are. 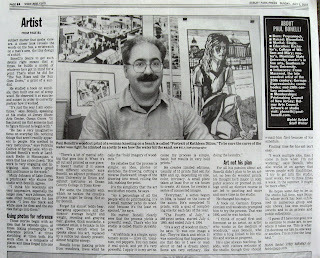 I'd like to welcome all first time visitors to this blog, those who found there way here after reading Bobbi Seidel's feature article about me and my work in today's Asbury Park Press. As you can see, it's a fairly long article, and the print version comes with some nice photos from staff photographer Bob Bielk. Click on the photos to enlarge and you'll be able to read the full text. For those who want to know more about the Studio and the blog, I suggest you check out the Welcome link to the right. If you'd like to learn more about the block (St Thecla of Iconium from the Everyman series) I'm shown cutting in the front page photos, all the steps from first sketch to finished block are available by looking in the May 2007 archives and the final version can be seen here. Feel free to look back through past postings to see other complete work, as well as progress on my current piece, A History of Art. And come back often to see new work, and to learn about exhibitions and other news. Visitors are always welcome at the Studio in Ocean Grove, but with my irregular schedule, I suggest that you make arrangements first using the e-mail link at the right. 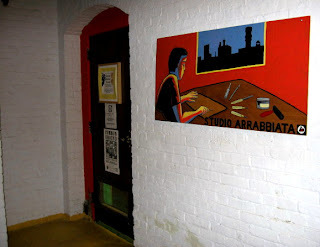 Thanks again to Bobbi Seidel for seeking me out and writing the article and to Bob Bielk for the photos, to Patricia Colrick and Molly Johnson for providing comments, and to the Jersey Shore Arts Center for providing such a nice home for Studio Arrabbiata.